DIY Polymer Clay Crochet Hook Handle – As you all know by now I really enjoy crocheting. It’s what I do to relax. A while ago, I tried my hand at amigurumi (the Japanese craft of crocheting small stuffed animals). It took me a little less than an hour to decide that amigurumi wasn’t for me and then it took me a bit longer to realize why… it hurts my hands. The little hooks that you use to crochet in this style are so tiny that you really have to get a good grip on them and I found my hands would cramp up. A few weeks ago, I randomly came across a photo of someone holding a hook covered in what I presumed was polymer clay and I had my “ah-ha” moment – that’s what I need to do for my hooks too. I went to the store and bought a variety of Fimo packages in different colors along with a straight blade for cutting the clay. I rolled and twisted and rolled some more until I had some marbled designs that I was happy with, popped them in the oven and 15 minutes later I had beautiful and practical crochet hooks. If you’re hands hurt from crocheting, I highly suggest this easy modification that will make a world of difference for your hands. Polymer clay in various colors (Sculpy, Premo, Fimo, etc.) *if you just want the functionality without the hassle of mixing colors, you can make things easier by just using one color. Choose 3-5 colors of clay and knead the clay until it’s soft and then roll the clay into little logs (I made them about 2″ long). Roll the clay smooth and until it’s about the width of a pen and about 4″ long. If you find your piece of clay has gotten too long as you rolled it out just cut off any excess clay so that you have it the correct length. 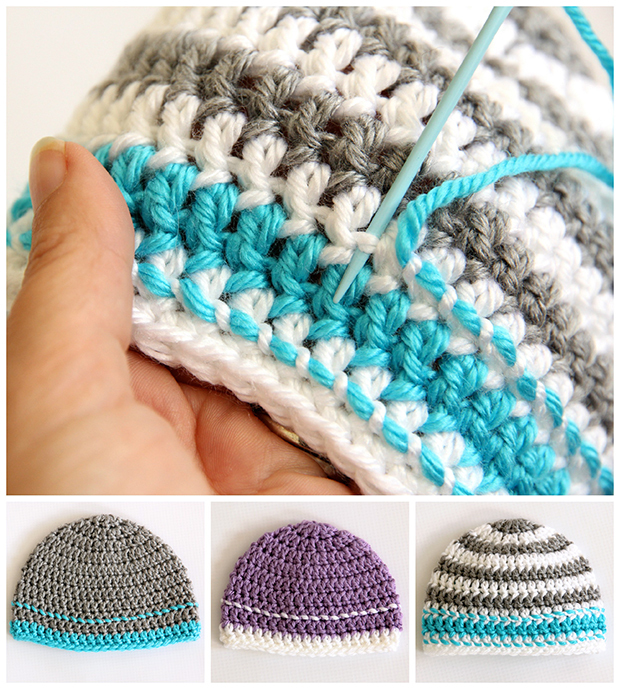 Gently take the end of your crochet hook and with a back and forth twisting motion push the hook into the clay. Be patient, it goes in pretty easily as long as it isn’t forced quickly. Keep going until you’re almost at the end of the clay log. Now roll the clay with the hook in it on the smooth surface and taper the end closest to the hook. Feel free to trim a little from the end if it gets too close to the end. On the side furthest from the hook, gently tap against your hard surface until it’s flattened. Ad a small circular piece of white clay to the end. This is where you’ll write the hook size with a permanent market or use a stamp to mark the size. 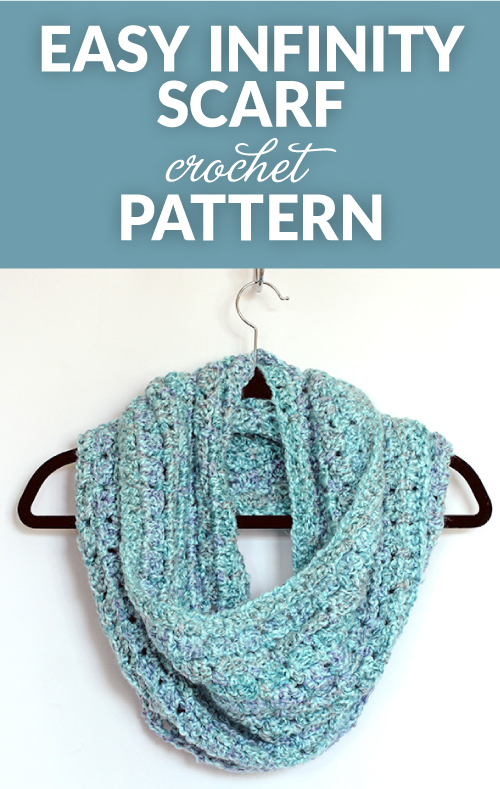 Place the crochet hook and handle on a cookie sheet that has a layer of parchment paper on it. Cook in the oven at 275 degrees F for 15 minutes (add a few minutes if it’s thicker than 1/4″). Also, if you’re new to crocheting and would like to take your crocheting to the next level before you try your next crochet project, I highly recommend some of the online crochet classes at Craftsy. Craftsy has amazing courses taught by world class instructors. Tutorial on how to make polymer clay grips for your crochet hooks. Easy Reversible Crochet Boot Cuffs – One of my very favorite things about this time of year is being able to break out my boots. Over the last season or two, boot cuffs or boot toppers have really become popular and rightfully so, they really help showcase your beautiful boots. I’ve been wanting to purchase some boot cuffs for a while now but haven’t found anything fabulous so I decided just to make my own instead. I created this design without any pattern (I’m thrilled they actually turned out). There may be better ways to make the boot cuff but this is what I came up with and actually, I love them. *A special thanks to my husband for being so patient while I directed the photo shoot and he took the shots. You’re a good man! A soft medium weight yarn. I used Red Heart Soft in Light Grey Heather. Crochet Hook – US J10/6 mm. Row 1: 1dc in the third chain from the hook and then one dc in every stitch until you’re at the end of the row. Turn. Row 2: Ch 2. 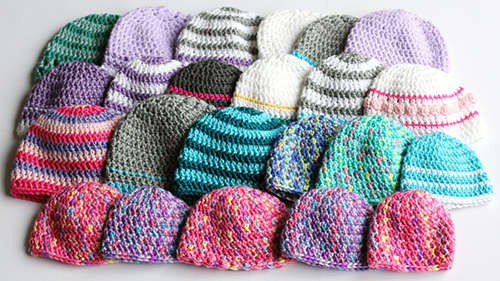 1sc in each stitch until you’re at the end of the row. Turn. Row 3: Ch 3. 1dc in each stitch across row. Turn. Repeat rows 2 – 3 until you reached your desired length. Keep wrapping the piece around your leg in the knee/calf area to fit to the correct size. The cuff should be snug enough so that it doesn’t fall down your leg but not too tight that it’s difficult to get over your pants. For reference mine was 13 inches wide. If these are for someone else, you’ll want to measure their legs before you start making the cuffs. Part 2: Textured side of the boot cuff. Row 1: 1sc in the second chain from the hook. *Tr in the next chain, sc in the next chain*, rep * until end of row. Turn. Row 2: Ch 3, *tr into the sc from the previous row, next sc into the tr from the previous row*, rep * until end of row. Turn. (tip: your tr should always be going into a sc stitch from the previous row and your sc should always be going into a tr from the previous row). Keep up this pattern until this piece is as long as the ribbed part of the cuff. Fasten off and weave in ends. Now using your yarn or tapestry needle cut a long piece of yarn and carefully sew together the two parts of the cuff along the longest sides (see photo below). When the long side is complete, sew together the two short sides. Weave in any loose ends. Follow the instructions above and create another boot cuff for the other leg. 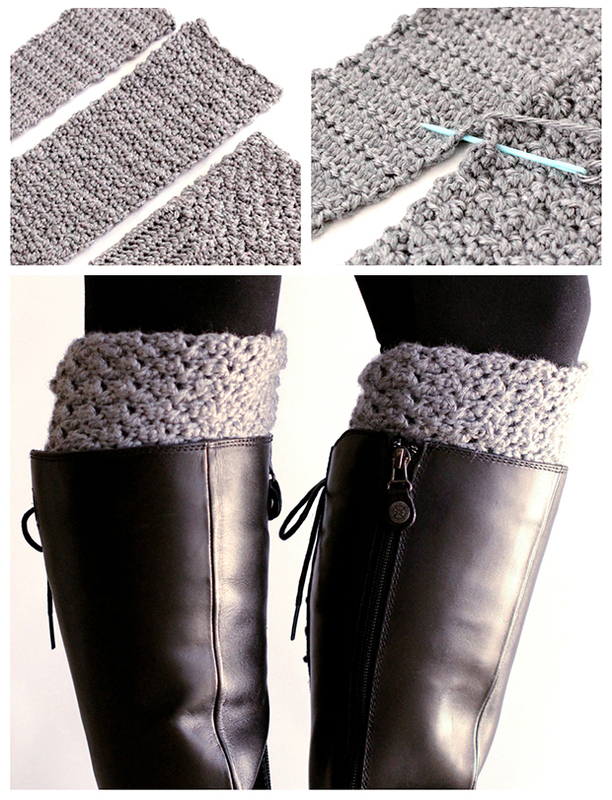 Easy pattern to crochet your own boot toppers.